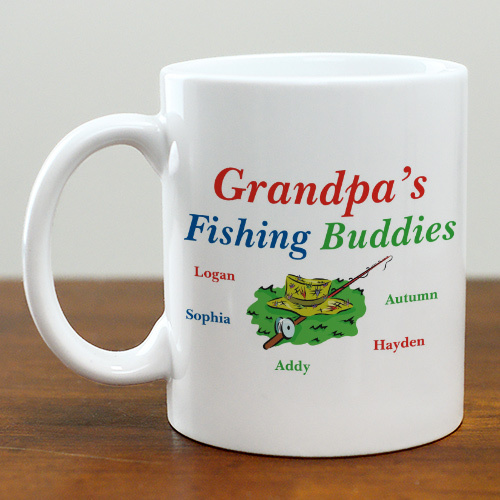 A Personalized Fishing Coffee Mug for Grandpa or Dad makes an inexpensive, personalized gift. Let him show of his other love with his new Personalized Fishing Coffee Mug for him. All of our personalized coffee mugs are Dishwasher safe and hold 11 oz. Includes FREE Personalization. You can make Father’s Day extra special for Grandpa or Dad with this Personalized Father’s Day Fishing Coffee Mug for Dad or Grandpa. Personalize your coffee mug with any title and up to 30 names. Being a father is very special; celebrate Father's Day with a personalized gift from GiftsForYouNow.com. We offer many personalized Father's Day Gifts including personalized Fathers day frames, personalized Fathers Day shirts & personalized Keepsakes for Dad. Get Dad a Gift he will cherish for years to come.